THIS WEEK RTÉ One launched its next season and, while Tubs was busy mugging for the camera, TheJournal.ie sat down with the new boss at the country’s most-watched TV station. Channel controller Adrian Lynch has been in the job at Montrose for less than a year after leaving his post as managing director of Animo Television, which supplied the channel with programmes like Celebrity Bainisteoir and The Secret Millionaire. While earlier today we revealed how Lynch and soon-to-be TV host Joe Duffy were at odds on the tight broadcast restrictions applied to referendums, we also had a few more questions for the station chief. TJ: How are you finding the shift from running your own TV company to working for the state broadcaster? AL: “When you’re running your own company, as any business owner knows, you have your ups and your downs, sometimes things are going well, sometimes things aren’t. I’ve worked in television all my life so I’m very passionate about that. Who do you look at as your biggest competition – and who do you keep an eye on most closely? “There’s two answers to that. One is that we compete against about 801 channels already so it’s an intensely competitive market but obviously we have TV3 and UTV in the home market, we have Sky who have a big presence here. But also within that, we’re very much committed to investing more money in programme making. Have you watched UTV Ireland, and, if so, what do you think of what they’ve been doing so far? One thing you often hear from the public about RTÉ is a resentment of having to pay TV licence money for the state broadcaster, whether they watch it or not. Do you think that RTÉ provides value-for-money for all those licence holders? “I think when you look at the licence fee … I think it’s about 33c a day so when you’re operating that many television channels, that many radio stations, orchestras, and it really is very central to Irish life… even just speaking from an RTÉ One point of view, it’s interesting being in the charter now, you really get a detailed view of the breadth of engagement it has with the Irish public, from news and current affairs to drama to entertainment. Another perception is that, whether it’s because of the funding model or the fact it’s a state broadcaster, RTÉ is a pro-government mouthpiece, particularly on big issues like, most-recently, water charges. Do you accept that with the way RTÉ is structured there’s an inherent bias in what you do? Love/Hate was a really big hit for RTÉ One, what do you think is going to be your next Love/Hate? “It’s an interesting question. Love/Hate was such a phenomenal success … there has been five series of that made, which is amazing, and it didn’t peak out earlier in the way. If you look at something like Fawlty Towers they only did two series of that and then they just left it alone, they didn’t go back. “I would never say never with Love/Hate. Stuart Carolan, who is the real creative, driving force behind it, he went off to write a feature film, Skippy Dies … I’d never say never in the coming two years, but at the moment we’re really focussed on offering a diverse drama (range) to the audience. What has been RTÉ One’s biggest success in the time you’ve been there? What’s the biggest flop or disappointment that you’ve had – and what have you learned from it? What’s your favourite programme on any station on TV right now? 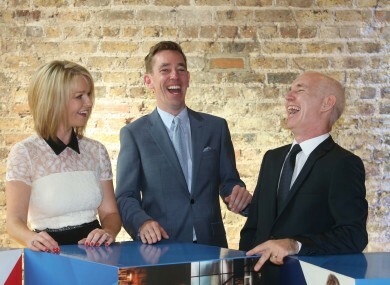 When it comes to the presenters and personalities you have on RTÉ One at the moment, who do you think is the best? And last question, what do you think of the Angelus? But what’s your personal view? Email “Love/Hate, licence fees and bias... we asked RTÉ One's new boss about them all”. Feedback on “Love/Hate, licence fees and bias... we asked RTÉ One's new boss about them all”.